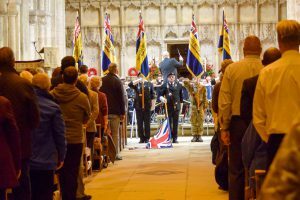 The fourth Festival of Remembrance was a massive success, with the support of the local cadet services in this years event. 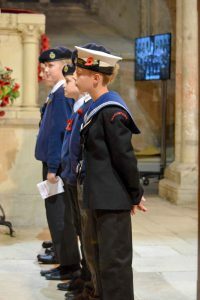 The Junior Sea Cadets gave poignant readings taken from children’s diaries in multiple conflicts. They captivated the audience within Christchurch Priory, who were absolutely enthralled with their words. In addition to the Christchurch Sea Cadets, we were joined by the local Army Cadets, who were helping us by selling programs and collecting for the Poppy Appeal. This year’s theme was ‘Passing the Baton’ and having both youth groups involved in this way was a brilliant addition to the concert. In addition to this use of the theme, we had the debut performance of one of the youngest members of the band, Joe Rutherford, composition ‘For the Fallen’. Composing has been a key way of expression for Joe and formed part his university application. Great thanks must go to all of the Standard-bearers who make the concert so much more than just a music event. Within this year’s performance they were key in the opening of the concert, marching on to ‘The British Legion March’ observing the National Anthem and exiting to ‘British Grenadiers’. 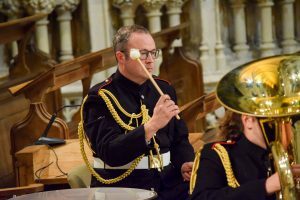 In addition they formed a visual aspect to ‘Fanfares in Remembrance’, a cinematic reflection on remembrance written especially for the Band to perform at the Menin Gate in May of this year. In this concert it was conducted by its composer, Peadar Townshend, to rapturous applause as it closed the first half of the concert. After a brief interval the band resumed with a couple of more ‘popular’ pieces, including an unusual Tuba solo from George Morley and selections of themes from James Bond films. The band then performed a medley of war-time favourites, such as ‘Keep the home fires burning’ and ‘It’s a long way to Tipperary’. Our finale was ‘Episodes at an Exhibition’, which featured three of the suites from Mussorgsky’s Pictures from an Exhibition. To view all of the photos from the evening please see the gallery page here. Many thanks to Jennifer Tingay for her photography skills.